So this time we went to a company who is contracted to do the 24 hr. EEG's. We went to this office and the technician was just soooo sweet to Noah! She knew just what to say to make him comfortable and happy. He got to watch a movie while she applied all the electrodes, etc.... Since this was his second time he was much more relaxed than the first. She told Noah he was getting a special space helmut like Buzz Lightyear and a spaceranger computer. He was so excited about that. Here he is getting the electrodes attached with a special glue. Once they got all the electrodes on she covered it all up with layers of stretchy gauze so he couldn't take the electrodes off. We were to write down most of his activites over the next 24 hrs. especially when he went to sleep and if he woke up at all in the night. Dave had to sleep on the floor in Noah's room that night to moniter him. 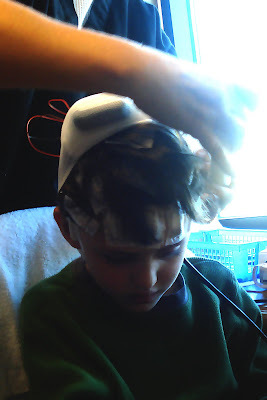 Noah did great and never bothered with his "hat" until an hour before his appointment to get it all off. I was feeding Baron and looked up and he'd pulled his hat off! The pic below is what he looked like after that. I kind of gently tried to cover his head back up with the leftover gauze. you can see all the wires sticking out from underneath the hat. Here he is with the electrodes glued on his forehead. the pic below is from the first day when he was all done being fitted with the hat and he had his little computer battery pack in his fanny pack. We love our little Noah so much, even more now that he's being put through all of this. He's been so brave and such a little trooper. Thank you all for your thoughts and prayers on his and our behalf. I'll update more on his diagnosis later. Don't forget about Mom and Dad...you guys are being brave too! Our prayers are with you. What a trooper. That is crazy all those wires. WOW! Hang in there!! We are praying for you all. poor guy! 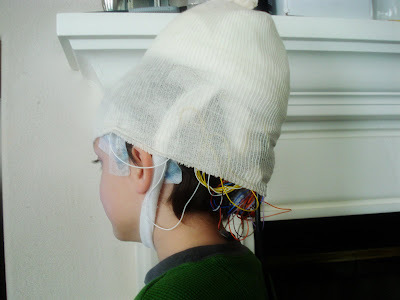 i can't believe he had to go a full 24 hours with all those wires and crap all over his noggin. What a trooper. Keep us posted.